I've been sewing! This weeks op shop find is a gigantic mens long sleeve top by Footlocker, size 3XL. I can't say why this enormous thing jumped out at me, but there was something about the fabric print that caught my eye. It cost me $3.50. I used a shirt dress from my wardrobe that I know fits me well as a template to cut the top to size. You can see the gigantic proportions of this top measured with my shirt dress! Worn with belt $3 from Salvos, Esprit cargo trousers $3.50 (co-incidentally bought from the same op shop I bought the Footlocker top from, but purchased last year). I'm really pleased with it. It is warm enough for the final winter weather Melbourne has to offer. Due to the sheer size of the top, I had a lot of the fabric left over, so used it to make a koala motif for a refashioned top for my son! His top is made from an old mens black T shirt (50c, same op shop) and fabric scraps. 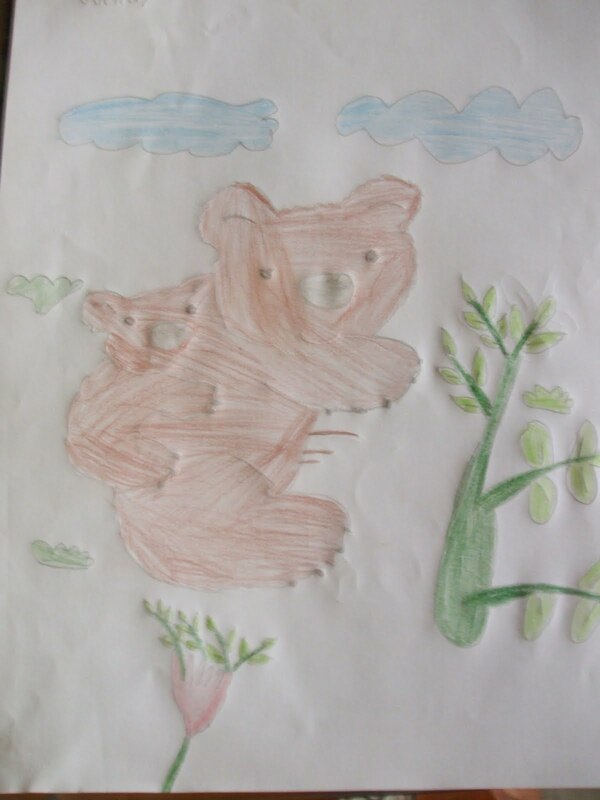 The Koala shape I have used from a picture emailed to me drawn by a child in a Honduras volunteer operated school c/o GVI Phoenix. Can you believe a child in Honduras draw this cute drawing? What is the coolest thing about refashioning? That NO ONE ELSE will have this exact top. I'm really impressed. How come you got the sewing gene and not me? Not fair! lovely dress and sweet koala print. great idea! The dress looks fab - wish I could find stuff like that to play with! I love this project! quick, simple & oh-so-thrifty. I think Upcycling clothing is so fun...and addicting! That is so clever. I love fitted clothes. Who would have thought? Wow, that was so cool, thanks for sharing. You make it look so easy. I'll keep it in mind next time I'm shopping for sneakers with my Foot Locker coupons. Maybe I'll find a treasure like you did.